Spice has come up with the low priced Pinnacle FHD mobile – a tough competitor of earlier announced Canvas 4 mobile from Micromax. Unlike Canvas 4 with HD resolution, this device owns a 5 inch Full HD display screen with a more powerful lithium battery and quad-core processing unit inside. Its prime rival Canvas 4 handset is packed with a quad-core processor, 13 megapixels camera as well as 2000mAh battery. Both devices are common in having supports to FM radio, 3G connectivity, dual SIM and many other new features. For full comparison of these two devices, please check my earlier post on Comparison between Micromax Canvas 4 Vs Spice Pinnacle FHD smartphones. Gionee, the China based company has also launched their new smartphone named E-Life E6, which is claimed to be the world's first white One Glass Solution (OGS) handset with Full HD display screen. With 2.54 mm bazel, 7.7mm thin body and 128 gm weight, the device comes packed with up to 31 GB internal storage. The handset has already been arrived in Chinese market and soon to be released in other countries. This is a small sized and light weight machine, easier to carry in anyone's pocket. With boasting of powerful camera, quad-core processor with a strong battery, this device likely to give tough competition to both - Canvas 4 as well Pinnacle FHD handsets. Both the handsets are identical with their 5 inches touch screen display with Full HD screen resolution. With 1,920 x 1,080 pixels resolution, both the devices win over Canvas 4 HD smartphone. But the Gionee handset is unique in respect to its World's first white OGS (One glass solution) display and 441 ppi pixels density. It is considered to be highest pixels range in mobile industry. The E-Life E6 smartphone is far up from Pinnacle FHD for having a 13 MP primary camera and a 5 MP front shooter. On the other hand, Spice handset owns an 8 MP auto focus rear-face and 2 MP front face snap shooter. The E6 device camera also includes Backside Illumination Technology (BIS) sensors to improve image quality in dim light. Its camera also supports HDR and Panorama features. Like Micromax Canvas 4, both Spice and Gionee smartphones also run on Android 4.2 Jelly Bean operating platform. Gionee mobile also allow users to use voice command for operating it. Both devices have same quad-core processors clocking at 1.5 GHZ. About memory system, both the machines' storage is expandable up to 32 GB. The Pinnacle mobile comes packed with 1GB RAM with 8GB on board storage where the E6 mobile wins for having double 2GB of RAM. Pinnacle FHD win for having more powerful 2100 mAh lithium polymer battery over the Gionee's smartphone, which has a battery of 2020 mAh. The Gionee handset comes appears to have more advanced features such as DTS 3D stereo surround with speakers and dual MIC as well. It also supports direct voice control features to allow use replying for and making direct calls using voice command. With doing some personal modifications into Android RAM software, the company provided option to easily capturing high quality images and video. It also supports head gesture to pause and play videos. On the other hand, the Spice handset allows its users to access up to 2 GB Spice cloud. A user can access documents, video, photos and music on cloud under some anti-theft features and proper security. There are also various other features including direct call and flip to mute etc. available on this device. The Gionee E-Life E6 handset has already been released in China at around $434. In countries like India, the device will be available in the next month. The Spice Pinnacle FHD handset will be available to customers at $283. The users can visit www.saholic.com to pre-book the device. Its delivery will be start from July 20th. Above description makes it clear that both the aforesaid Android smartphones with full HD resolution are the high-end devices embedding multiple user-friendly features. Though the Gionee' E6 handset comes with more advanced features which are not available in Spice mobile yet the price difference between the two can highly affect both devices sale. A huge difference of around $150 can store the customers to Spice and Micromax retail stores only. The second is the brand issue, which can hinder Gionee smartphone from other two devices. Spice telecom and Micromax already have good position in potential mobile consumption market like India but Gionee still has to make its market reputation in such countries. Let us leave this issue on time. We shall update you with the market competition results of these three handsets, after release of these devices. Till then keep visiting to remain update with market's latest tech gadgets information. 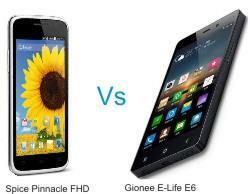 Have anyone used Gionee E-Life E6 yet? Gionee is a Chinese company and do you trust the quality? Do they have customer support centers in India?